Seville oranges are traditionally used to make marmalade but they’re also wonderful in this fragrant pud. 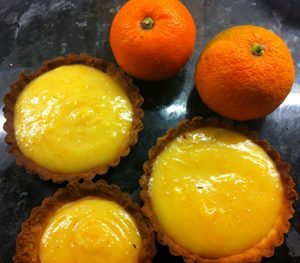 Think lemon curd, only orange-flavoured; it works perfectly. Serves 4. One pack of shortcrust pastry (or make your own sweet shortcrust pastry with 175g plain flour, 125g unsalted butter, 60g icing sugar and the yolk of 1 egg). You will need a 23cm tart tin with removable base. Make the pastry as usual (rub butter into flour till like breadcrumbs, then add sugar and egg-yolk – or whizz the lot in a food processor; leave to rest at least 2 hours in fridge or overnight if you can). Or use ready-made pastry. Roll it out and line your tart tin. Preheat the oven to 200°C, then bake blind for 15 mins until the edges are just starting to colour; cover the pastry with foil and baking beans, if you have them. Remove the baking beans (if used), take off the foil and cook another 5 mins to colour the base (cover the edges with strips of foil if you think they might burn). Take out of the oven and leave to cool; it won’t be cooked any more, so check that it’s nicely baked. Make the curd: whisk the eggs and sugar together in a bowl; add the juice and zest and whisk again. Melt the butter in a heavy pan. Add the eggs/sugar/juice and heat very gently (you don’t want scrambled eggs, so keep the heat low), stirring all the time until the mixture is fairly thick – this will take about 20 mins. You’re aiming for a consistency that’s like lemon curd, not solid but not runny. Pour into prepared pastry case, cool for a few mins, then pop into the fridge for half an hour to set – or eat it warm, when it will be very gooey but delicious.